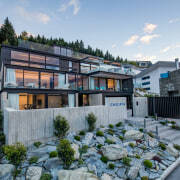 ​​​​​​​Instead of being built in schist and wood to evoke its mountain setting, this glass, concrete and steel home by Gary Todd Architecture embraces its natural environment by appealing to four of the five senses. Often mountain homes are connected to their setting simply by being constructed with local materials. 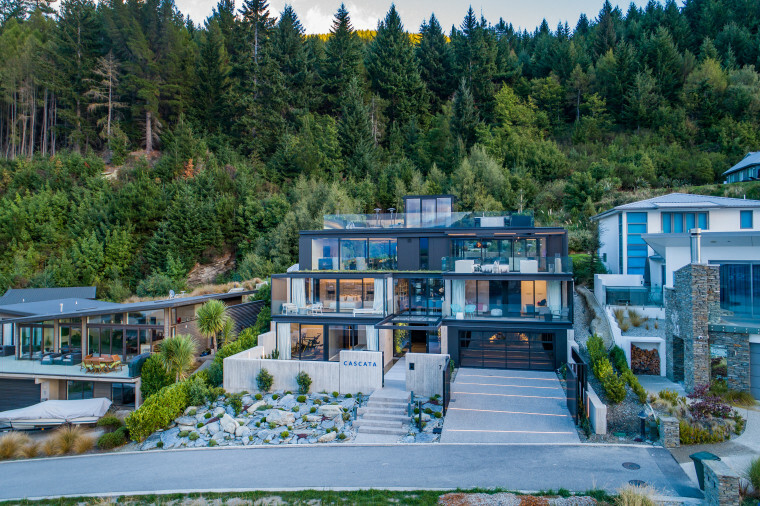 However, this modern residence – with alpine and lake views to the front and forest and stream outlooks to the rear – takes a more immersive approach. 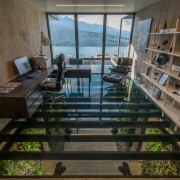 Architect Gary Todd says he wanted this to be a sensory biophilic residence – essentially, a house designed to evoke its environment through the senses of sight, sound, smell and even touch. Nestled on a modest, sloping site, the four-tiered concrete, steel and glass home has a clean-lined architectural presence. 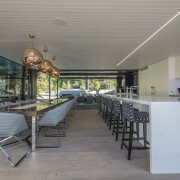 Cantilevered decks reach out to the scenery front and back, while solid and louvred walls provide privacy from the street below and from neighbours. 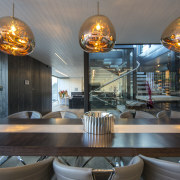 However, seen front on, the extensive glazing gives the four-level home a transparent quality. 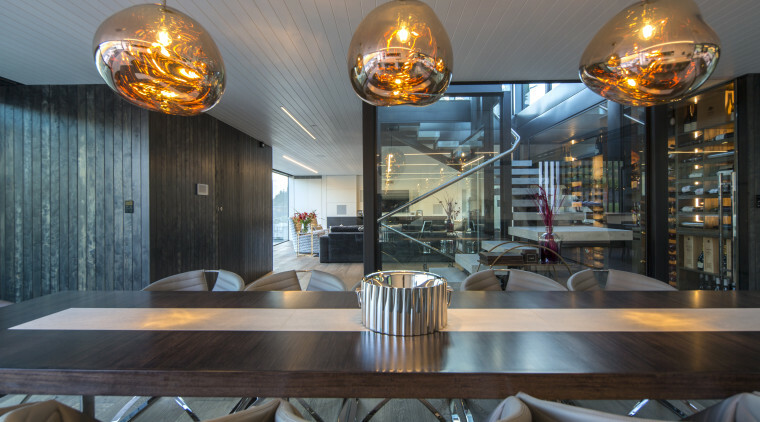 ​​​​​​​Sculptural pendants over the dining table reflect the sprawling third-floor living zone in this mountain residence. The powder room door to the left has no handle, a minimalist touch seen right through the home. Instead, doors are push-to-open with only tiny occupancy indicators on show. 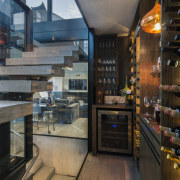 Level 1 comprises the entry, stair and lift access, garage, laundry, gym and guest room; level 2 has three bedrooms, an office and movie room and connects to a outdoor spa and sauna; while level 3 is the sprawling open-plan, indoor-outdoor living zone. Lastly, the home’s glass lift accesses the top-floor entertaining zone, complete with its all-weather seating/dining, teppanyaki island, lush plantings and 360° views. Visitors appreciate the setting visually through the extensive glazing. However, this is only one of the senses engaged here. However, though it all looks free and flowing, in reality pump systems create the illusion of a connected water flow – even though glass walls separate the stream from its indoor counterpart. 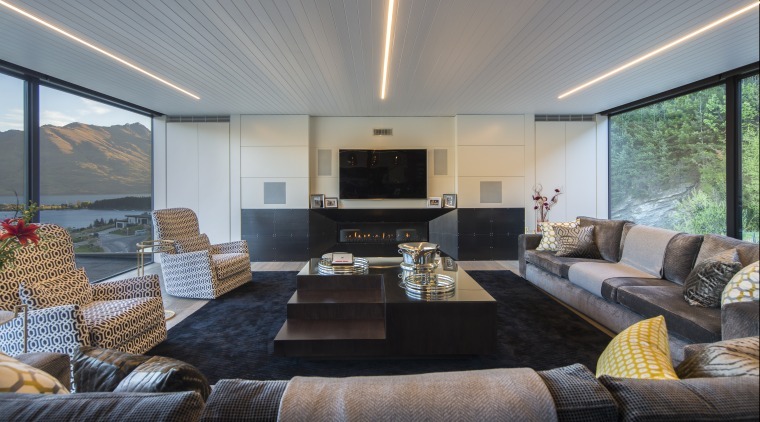 ​​​​​​​Ceiling strip lights are used in several areas of the home – while they are white in this living area, some can change colour to vary the ambience. So this flowing water finds its way into the long, linear ponds flanking the entry – thus providing a natural water connection to the lake as one enters the home. 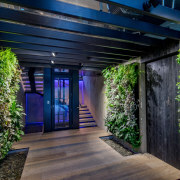 Once inside, visitors experience the scents of nature, as well – thanks to the lush vertical gardens on the hallway walls and further scented plantings on the rooftop. Then there’s a fourth sense – touch. Board-formed concrete walls reflecting the texture of forest trees, the use of natural stone in ponds, and an exposed rock feature in the garage are just some tactile elements. The house has features that go beyond the sensory, too. 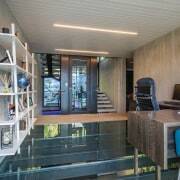 The foyer has a dramatic glass ceiling – the floor of the home office directly above – creating the feel of an airy, double height volume as you enter. And while the home is south-facing, the interiors are light-filled and sunny. While the home looks made for a warm climate with a facade that’s 70 per cent glass, the windows and doors are triple- glazed and argon gas filled. Winter or summer, the home is always comfortable.